As a story, Puccini’s Turandot is textbook orientalism: set in China, the opera revolves around the cold-hearted princess Turandot, who fends off royal suitors by asking them to solve three riddles before consenting to marry them. If these princes and kings give the wrong answers they are beheaded. By the time the story opens 12 heads have already rolled, giving Turandot gold medal as exotic femme fatale, the archetypal feminine destroyer of men. However, none of this deters Calaf, son of the exiled king of Tartary, who falls in love with the princess and decides to try his luck. Consumed by passion, he carries out his mad plan despite everyone’s repeated warnings, including an ardent plea from the young Chinese slave Liu who declares her devotion to Calaf and completes the love triangle. What follows is a story of conquest over the sensual and bloodthirsty East, which in this new-to-Chicago production unfolds under the serpentine figure of a gigantic red dragon created by designer Allen Charles Klein and gloriously lit by Chris Maravich. The grandeur and energy from Sir Andrew Davis’s orchestra match the dragon’s imposing presence. Unfortunately, tenor Stefano La Colla (Calaf) had trouble riding the orchestral behemoth throughout much of Act 1. He did gain steam by the time the opera’s signature piece, Nessun dorma, arrived but overall he was no vocal match for Amber Wagner’s Turandot. Here’s a powerhouse of a soprano, hitting the most difficult high notes with the force of a wrecking ball. The night’s other delights were the Chicago Children’s Choir and the comic trio of court jesters played by Zachary Nelson, Rodel Rosal and Keith Jameson in such a way that surely, the last laugh belongs to them. Rob Kearly directed. 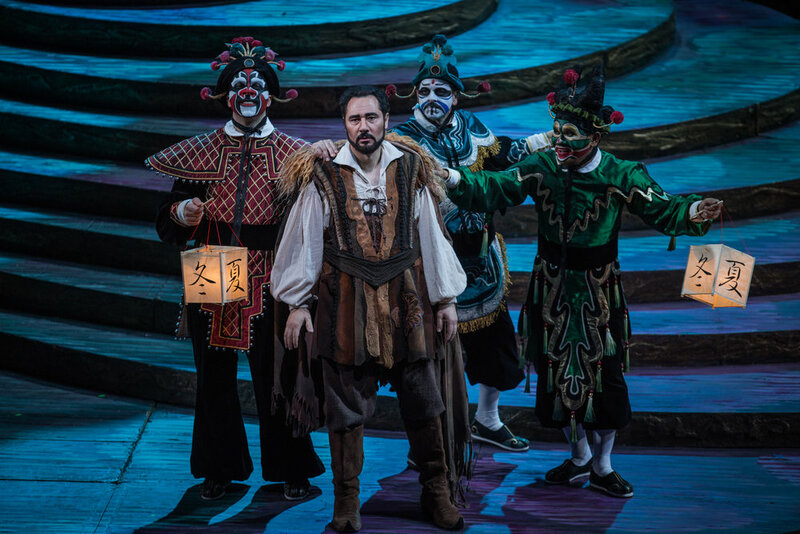 Turandot runs at the Lyric Opera of Chicago through January 27th. Tickets are available online at www.lyricopera.org. Additional information can be found at www.theaterinchicago.com. Josh Lovell and Amber Wagner in TURANDOT at Lyric Opera. Photo by Todd Rosenberg.